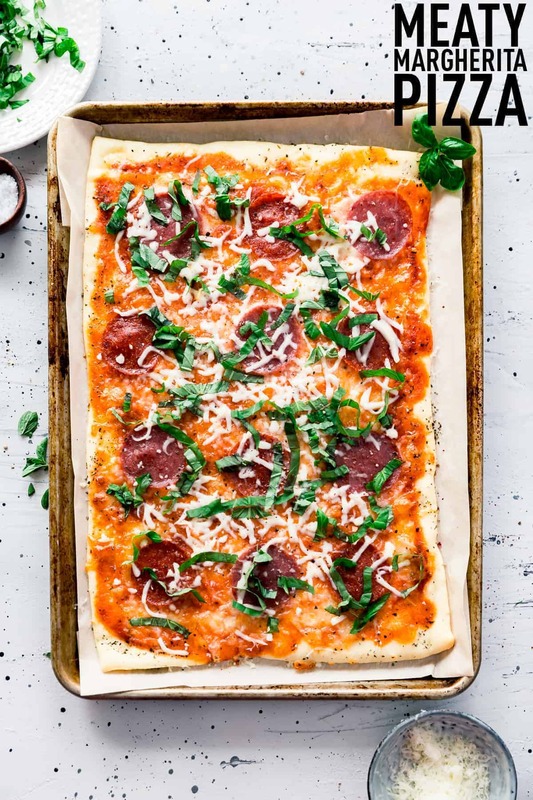 Meaty Margherita Pizza made with the traditional tomatoes, cheese, and basil but with added pepperoni and salami to make it one crowd-pleasing pizza done in only 30 minutes. Pizza done in just 30 minutes?! Sign me up! 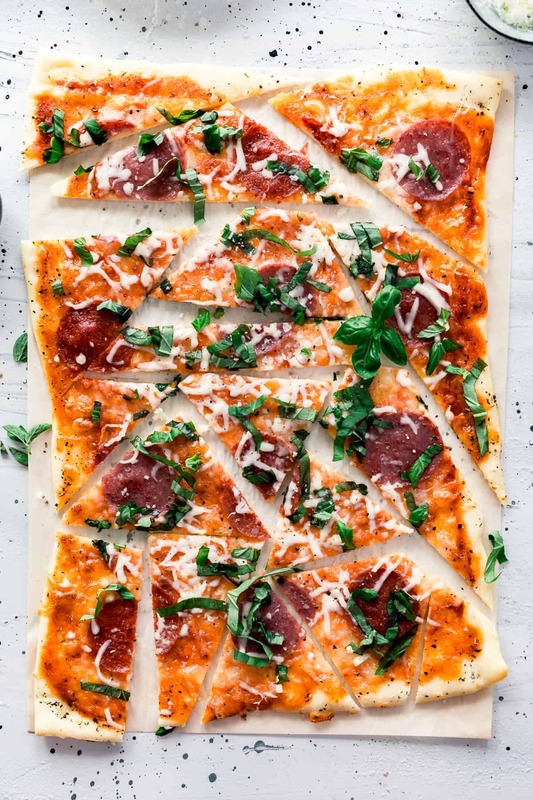 This pizza is unique because the crust is made from yeast-less dough! Instead of yeast, the dough has a bit of baking powder in it which helps it to rise just a bit while baking. This is a great recipe to have up your sleeve when you need to get a quick and easy meal on the table in no time. Who doesn’t love pizza? A traditional Margherita pizza is made with tomatoes (whole or crushed), a little bit of cheese, and fresh basil on the top. 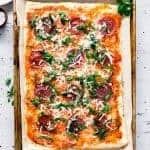 This is a meaty spin on that classic pizza with the addition of just a little bit of pepperoni and salami. This makes the pizza a real crowd-pleaser in my house. It’s thin, bright, and satisfying without being too heavy or greasy. Meals that are quick and easy and made from things I normally have on hand are always a win! The dough should be a bit thin and easy to work with but not stick, so knead it a time or two on your counter as needed and use flour on your parchment paper if it starts to stick a little bit. To roll out this pizza, I have a little handled roller that works great for rolling pizza out on parchment. I use it often. It’s only $5 and my kids like to play with it when they are playing with play dough, too. Fresh basil is a must for this recipe. It really makes this pizza bright and flavorful. You can get small quantities of salami and pepperoni cut for you at the deli counter of most grocery stores. Why do they call it Margherita Pizza? There’s a story somewhere that says the best pizza maker in all of Italy made a pizza to honor Queen Margherita that highlighted the colors of the Italian flag – red, white, and green. 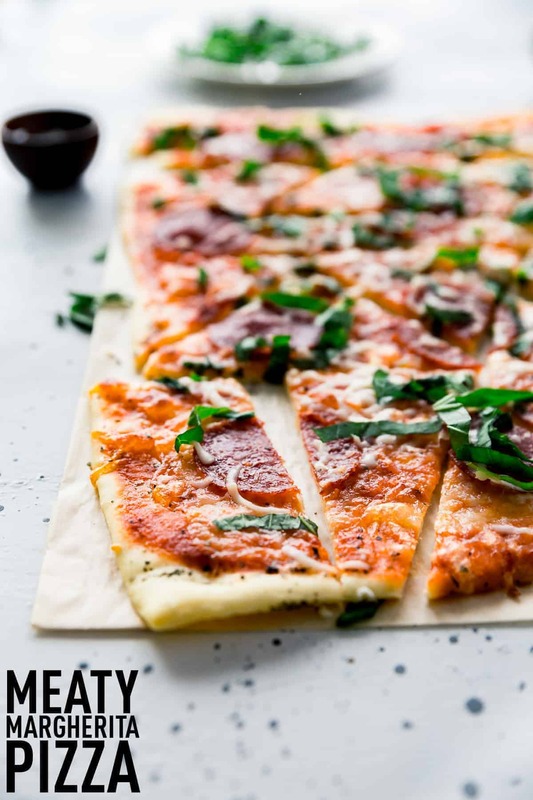 The pizza has only grown in popularity and that perfect pizza combination of tomatoes, mozzarella, and basil became a fast favorite. Meaty Margherita Pizza made with the traditional tomatoes, cheese, and basil, but with added pepperoni and salami to make it one crowd-pleasing pizza the whole family will love. Preheat oven to 450 degrees. In a large bowl, combine all the dough ingredients and knead with fingers until a soft ball of dough forms, and all the butter is thoroughly incorporated. Turn the dough out onto floured parchment paper and roll out into a rectangle about 1/4 inch thick. Gently brush the dough with olive oil, then top with the crushed tomatoes. Sprinkle with salt, garlic powder, and dried basil, adjusting seasoning as needed. Top with the mozzarella cheese, then layer with the pepperoni and salami. Bake for 12-15 minutes, or until the pizza is golden brown. Remove from oven and top with the chopped fresh basil. Serve immediately. So much pizza to love! 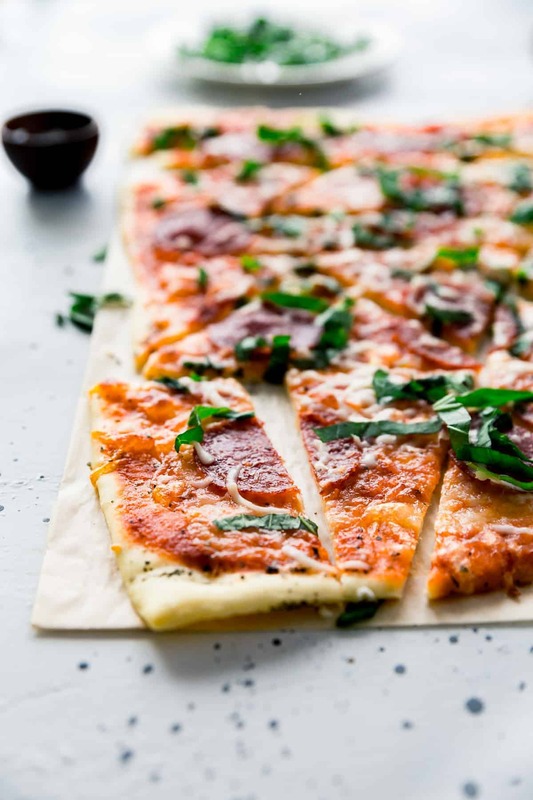 I can’t wait for you to try this 30 Minute Meaty Margherita Pizza because I know you are going to love it. Enjoy from my kitchen to yours! This pizza looks fabulous! I love homemade pizza bc it’s not so greasy! Definitely going to give this one a go!! Thanks for sharing! Love a thin crust pizza! What a time saver this is, not having to let the dough rise!